Schrö: Heya, Cap! What have you been up to? Rip: Now, Schroe, the Captain’s probably forgotten how to talk by this point. The rooms of Major Montana Max are soundproof, free of cameras, and sealed with a digital lock. Only three people know the entry cod.e the Captain is one of them. Zorin is not. She isn’t recognized by the fingerprint scanner, either. Major!Zorin: This isn’t going to work, is it. Major!Zorin:Zorin, meet us at the lab. Zorin: Sure thing, Herr Major. Rip!Schrö: I don’t see him. He’s not on any of the security cameras. Should we mount a search? Major!Zorin: No need. It means he’s in my room. After that, our antiheroes decide to stay in one place as much as possible. Doc: Come up to the lab and see. Major!Zorin: If you’d said that ten minutes ago, I wouldn’t be out $50. Doc: That’s why I don’t play cards with Alhambra, Herr Major. La Vie Boheme continues. SarahBelle still wrote the lot of it. 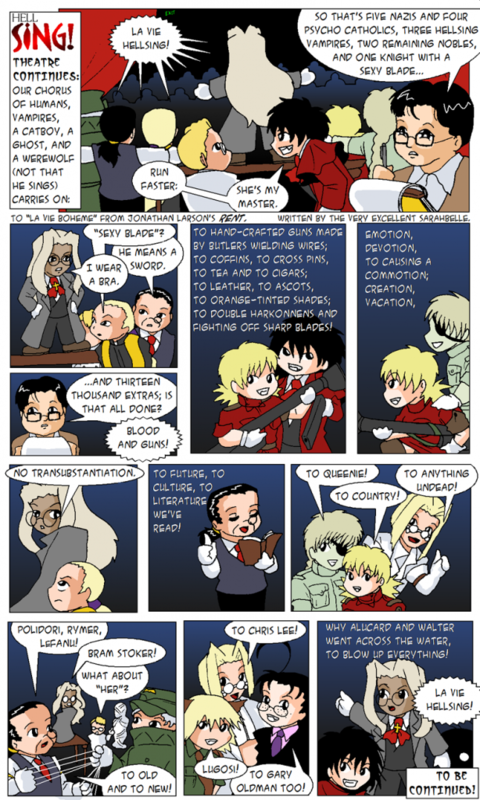 Alucard: Run faster – she’s my Master. Walter: He means a sword. Integra: I wear a bra. Kouta Hirano: And thirteen thousand extras; is that all done? To double Harkonnens and fighting off sharp blades! Walter (who reads a lot, and also breaks the fourth wall): Polidori, Ptah, Le Fanu! Walter: To old and new! Rip: To Gary Oldman, too! Major!Zorin: Before we panic, we should check the control room. Rip may be somewhere in the base. Major!Zorin: See? She’s in her own room. There’s no need to worry. Glamour, from Celtic mythology, is the faerie ability to change the appearance of things. Reseda doesn’t actually have faerie abilities; she just thinks of her vampiric abilities as “glamour” because it’s the word she grew up with. Reseda (thinking): I won’t figure anything out if I just follow and stare at it. For the record, they’re in Koblenz, the town in which (according to Shine canon, at least) Rip grew up. It was occupied by France during WWI, was badly damaged during WWII, and is now part of Germany, so I doubt it looks anything like she remembers. Reseda (thinking): What is that? It’s not a vampire, or a werewolf, or any creature I can recognize. But it’s not human. It has cat ears, and this isn’t Japan. Dandy!Captain: I don’t trust you. Doc!Dandy: If you hurt my body, I’ll…I’ll shave off your moustache! This stops. NOW. Time to leave Doc alone so he can do his work. Major!Zorin: Hey, I like being strong!